UrbanCincy: Could streetcars be manufactured right here in the Midwest? Could streetcars be manufactured right here in the Midwest? On July 1 the United States celebrated the completion of the first American-made streetcar. Secretary of Transportation Ray LaHood was in Portland to celebrate the moment. The Infrastructurist points out that Oregon Iron Works felt like they could be profitable producing the modern streetcars, and feel that they are already producing a superior product than what is being produced overseas. CincyStreetcar says that this event illustrates two important issues. When examining this news one could also speculate on what this could mean for Cincinnati as it develops one of the first streetcar systems in the Midwest region of the United States. Last month when the City announced the selection of the development team that will help finance, plan, design, construct, operate and maintain Cincinnati’s modern streetcar system they also announced that Cincinnati Streetcar Development Team partner, Stacy and Witbeck Inc., will be opening a new office in downtown Cincinnati and will also be relocating their executives to Cincinnati specifically for this project. Could the same also happen in regards to the production of streetcar vehicles in a state and region that was built on manufacturing and could easily produce streetcars with the existing infrastructure and talent in place here? Columbus and Cleveland have recently examined streetcar systems for their cities. Milwaukee recently received tens of millions of federal dollars to build a three-mile modern streetcar system in their city that is being seen as a started line to a much larger, city-wide system (similar to Cincinnati’s effort). St. Louis and Minneapolis currently boast light rail that has vehicles similar to streetcars and could potentially be produced on the same line. Indianapolis is working on a light rail system there that would also fit into this category. With all of these existing and future systems in the Midwest, it would seem reasonable to have a manufacturer for those vehicles right here. Could Cincinnati or Ohio attract such a firm, or grow one of their own so that it starts producing streetcar and light rail vehicles in one of the many plants we have that used to produce automobiles? I can think of a lot of abandoned and unused buildings that I've explored that would be perfect places to house this kind of production. 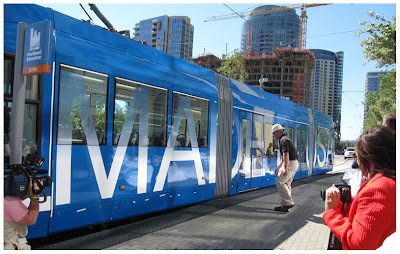 Now, if only Cincinnati could get it's hands on some American made Streetcars, or a streetcar system for that matter.